When Smart Can Be Really Dumb! One website knew my age and familial relationships, another traffic violations, and another showed government filings including property taxes and purchase price on homes. Yes, many websites might actually know more about your web behavior than you are aware. There appears to be no such thing as privacy on the web, as the website creators have gotten smarter at collecting, collating and predicting individual behavior. Much as I try hard to limit the leakage of personal data into this public library, it has been a losing game. This piece is not about the issues related to the devastating loss of privacy, or what can be done to protect oneself. Rather, its more a reflection on the amazing intelligence demonstrated by theses websites in generating such massively detailed personal databases. And yet, given how intelligent these systems are, they fail miserably at the simple stuff we should take for granted. Let me explain. Most, if not all, websites can use your IP address (a unique identifier for your computer while you are connected to the internet), to figure out approximately where in the world you are browsing from. Why might this be useful? Well for example, the web owner might want to show you ads that are for services in your town or city. Or if you are searching for a retailer, like Walmarts, in Mapquest, then it might help find the store closest to you. This kind of smart web service might actually be quite useful. But what happens when it goes awry? We live in the United Arab Emirates, where Arabic is the native language. 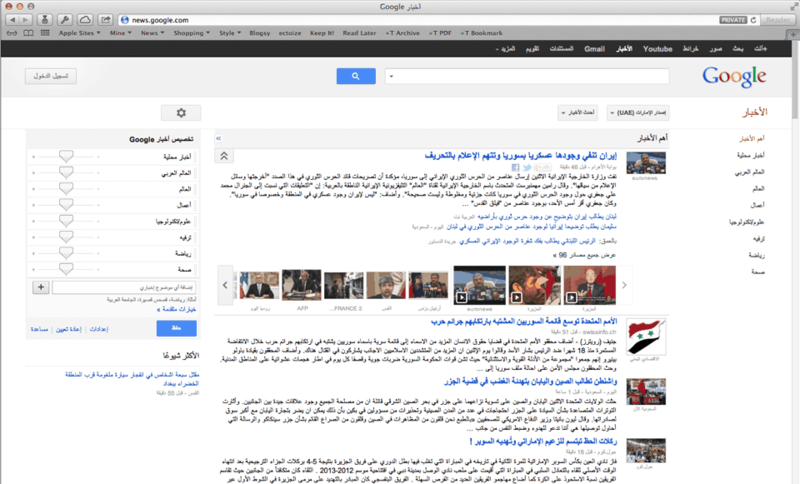 When I am browsing to Google.com, Google discovers my IP address is based in the UAE and automatically switches me to their Google.ae page (shown here) which is a great landing page if I spoke Arabic. It’s kinda smart that they do that, the first time. But lets face it, if I am an arabic speaker, I probably know there is a google.ae. Why would I type google.com into the browser (if I really mean Google.ae, after all it’s actually one character longer)? And why after Google has taken me to Google.ae, if I retype Google.com, it does not think I really mean the dot com site in english? 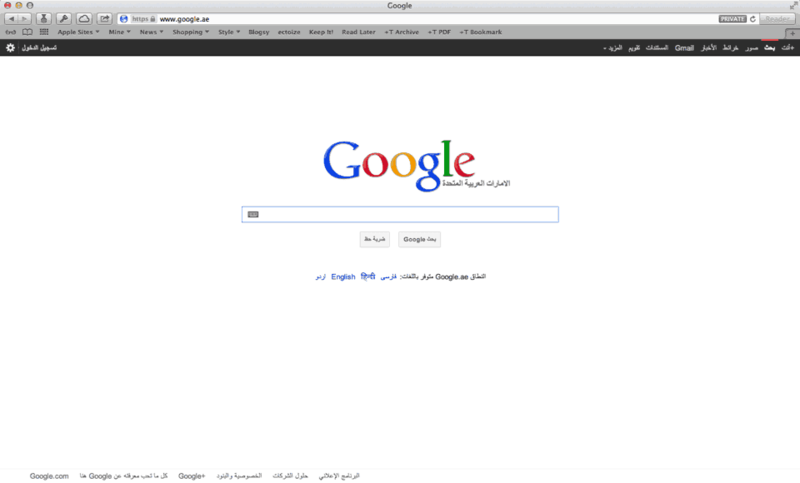 Even worse, look at the Google.ae landing page. For the longest time I could not figure out where to change the language. And only much experience led me to discover the small Google.com link lower in the page written in English. Now, they have added the English link, but that still brings me to the Google.ae site, except in English. Finally, any real statistical evaluation of language used in the UAE by internet users would have suggested that the folks browsing to Google.com from the UAE are more likely to be english speakers than Arabic, and that if they type Google.com, they really mean Google.com. I shudder to think what this experience would be like if my native language was Chinese or something other than English. The smart, dumb thinking does not end there though. It follows through on other Google sites, like News. At least they are consistent. Again, no place for me to change the language. The only clue I have is the box with UAE and a little triangle. But I would have to be a savvy user to know that’s where I can click, and then only to change the country base for the news articles, so no English UAE. The smart dumbness isn’t exclusive to Google by any means. In many ways they are the least dumb, smart websites. 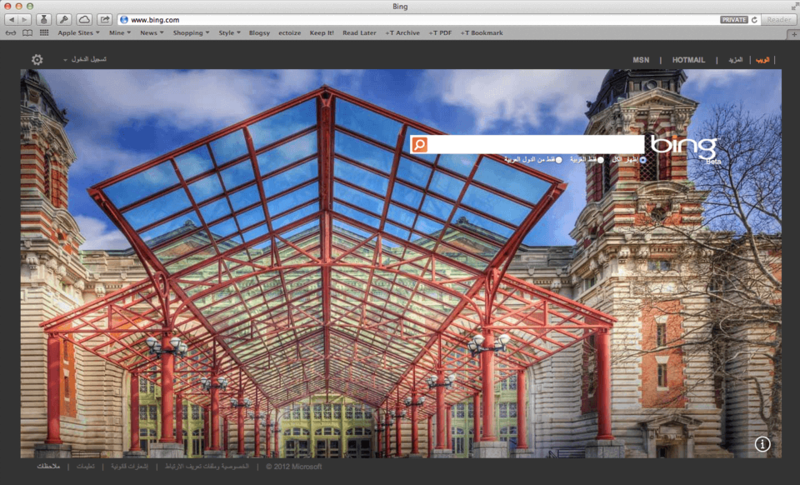 Take a look at the Microsoft Bing home page shown at the top of this post. The Bing website is very pretty and so smart that I have not been able to figure out how to change the language yet. If I want to use the great US based Bing travel search system to check airfares in the USA, I cannot because I don’t know how to get to that site. It keeps resending me to the Arabic language site. The result? I never use Bing from here! Sometimes, one can be too smart and ignore common sense. That I think is dumb!